There comes a point in every computer’s life where it starts to show its age. Thankfully, that’s a lot longer than it used to be, but my old computer, which recently celebrated its 6th birthday, was starting to show its age. The solid state drive and graphics card upgrade I did almost a year ago helped, but I still had to put up with framerate problems on some games. We seem to be in a good spot where graphics have leveled off, partly because we hit a bit of a wall for a while in chipset design, and partly because nobody has the budget to make graphics that look better than what we already have. Seriously, AAA games these days have graphics that look better than movie CGI from six years ago. Since Intel doesn’t make CPUs with the same socket they did six years ago, a new CPU (the main performance bottleneck I was hitting) meant a new motherboard, and if I’m going to all the trouble of getting a new motherboard, I might as well spend a little more and build a new computer from scratch. Besides, my wife has been gaming on a laptop for several years now, and it was high time she got an upgrade. 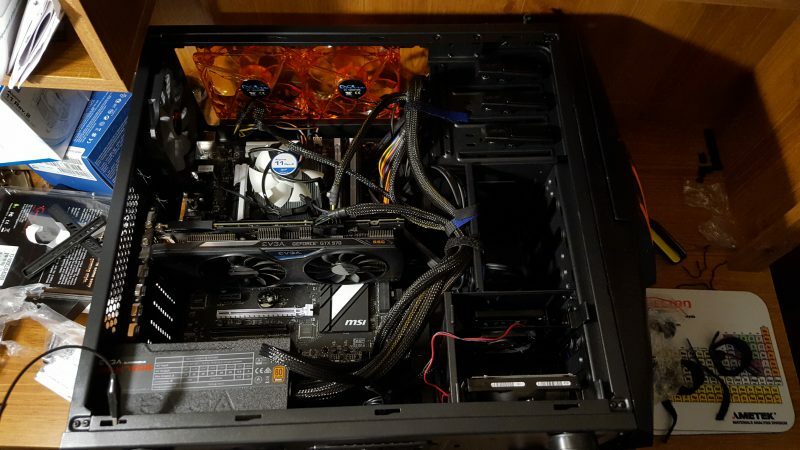 So, with a budget of around $1000 of tax return money, I set out to build a new computer. I absolutely love this case. It’s hard to see here, but the orange LED fans in the top intake are a really cool effect. 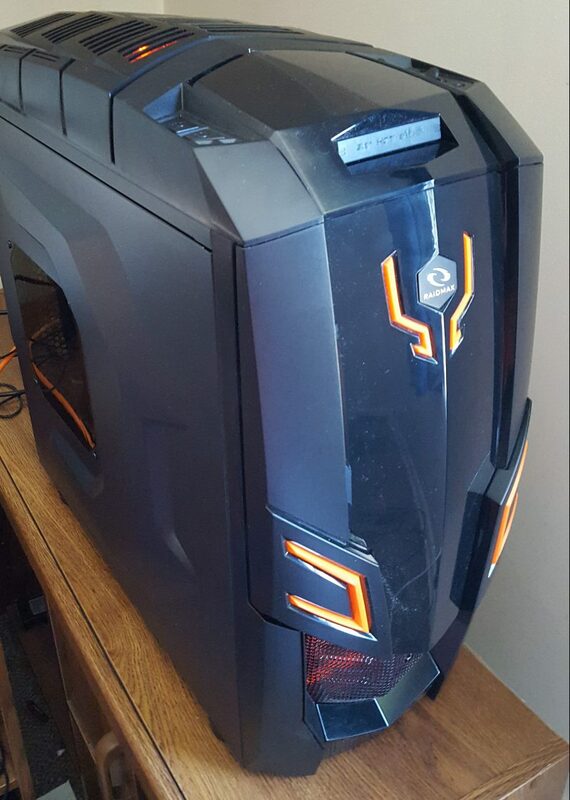 Is it the greatest gaming computer in the world? No, but I think it’s pretty good within the budget. I had planned on getting an i7 processor, but when I did some research, I found that the i5-4690K has almost identical benchmark scores to the i7-4790K, for $100 less. I actually saw one benchmark that put the i5 above the i7 (but only one). Both were near the top of performance-to-dollars ratio. You may be surprised to see only 8GB of RAM, but honestly, you don’t need more than that. Open up your resource monitor next time you game, and you’ll probably see no more than 6GB of RAM being used. RAM is dirt cheap, so people tend to load up their computers, but I’d rather spend money on faster RAM than more RAM. My wiring jobs always end up looking like a mess… and this is with some of it wired behind the motherboard. By the way, despite the fact that I built this computer myself, I usually warn other people away from doing so if they can help it. You really don’t save that much money these days, and for the 10% more you’re going to spend on a pre-built computer, it’s worth it to be able to just send it back if there’s a problem. And believe me, there is always a problem. This time around, everything was going smoothly, I got Windows installed, got started on some basic software and drivers, and decided to format the magnetic drive so I could get some games installed to it. When I did, the Windows Disk Management utility crashed. I didn’t think much of it at first. It probably just didn’t like some Windows update or software installer or other. Then I rebooted, and the computer refused to come back up. Long story short, the magnetic drive was bad, and, despite the fact that the OS was installed on the solid state drive, that was preventing it from booting. I pulled the bad drive out and the computer worked fine, but it was several hours of trial and error, attempting (and failing) to repair/reinstall Windows, chkdsk-ing, and reformatting before I identified the problem. Fortunately I was able to get a replacement drive shipped to me for free, and, due to some confusion in shipping, they actually shipped me two drives and told me to keep the extra, so thanks EOL Tech! I’m still having some weird problems with it freezing at the motherboard logo every other time it boots (and I mean literally every other time it boots, which is very strange), but once it’s up it works great, so I haven’t spent much time or effort trying to figure that one out yet. All that to say, if I had ordered it pre-built, if I had any problems on arrival, I could have just returned it and gotten a new one, but since I built it myself, I had to do the work of troubleshooting it and contacting the manufacturer for a new part. Overall, I’m really happy with my new computer, and hopefully it will last me another six years! If you’d like to show off your rig, feel free to leave a picture and specs in the comments! I just replaced both my PC and Mrs Bhagpuss’s with something very similar. Our previous machines were also six years old, which seemed like a good run, but like yours it would have meant new motherboards to upgrade again and that’s where I draw the line with my self-taught PC maintenance skills. I actually went to the trouble of comparing the costs of buying the parts vs the finished ma chine and there was next to no difference so I really can’t see the point of self-build unless it’s something you enjoy for its own sake. As you say, let’s hope these last another six years.